The bout served as a rematch, as Poirier had previously defeated Holloway via first round submission way back in 2012. Holloway, the UFC current featherweight champ, entered tonight’s main event on a thirteen fight win streak. In his most recent effort at UFC 231, “Blessed” battered Brian Ortega on route to a TKO victory. Meanwhile, Dustin Poirier entered tonight’s event headliner on the heels of a TKO victory over former 155-pound champion Eddie Alvarez. 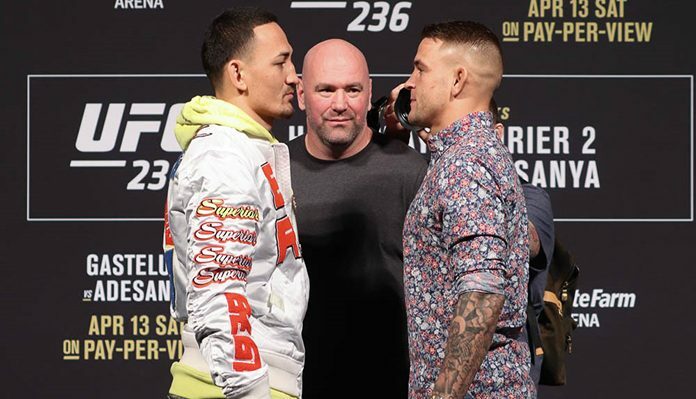 Tonight’s UFC 236 main event lived up to expectation as Max Holloway and Dustin Poirier proceeded to go to war for twenty-five straight minutes, much to the thrill of the fans in Atlanta and watching at home. Despite going the distance, after five-rounds of action it was clear that “The Diamond” had done enough to capture his first career UFC title. In the end, the judges awarded Poirier a unanimous decision victory 49-46 on all scorecards. Check out how the pros reacted to tonight’s UFC 236 main event between Max Holloway and Dustin Poirier below. What was your reaction to tonight’s UFC 236 main event? Sound off in the comments section PENN Nation!